B. Braun Spine Days is an interactive Virtual Reality application that offers an overview of lumbar spinal surgery using ENNOVATE® and XP®, two new products from B. Braun Melsungen AG. The project had a technical and an artistic goal. On the technical side, we wanted to offer an informative and interactive true-to-life presentation of two novel surgical procedures. The application features two interactive surgery sequences: ENNOVATE®, a new screw model for spinal cord surgery, and XP®, a new disk implant. The instruments were carefully rendered in Virtual Reality and programmed to allow a natural and precise interaction sequence. Design-wise, the application offers immersive and engaging spatial experiences. Our team of architects created a responsive three-dimensional lobby to act as B. Braun’s visual identity in the virtual world. The lobby environment reacts to changes in user input and to scene transitions. A special feature of the application is a level that represents the osseous tissue of the bone: Bone Land. Before entering the operating room to perform the implant surgery with XP®, the player changes to microscopic scale and travels through the bone structure. 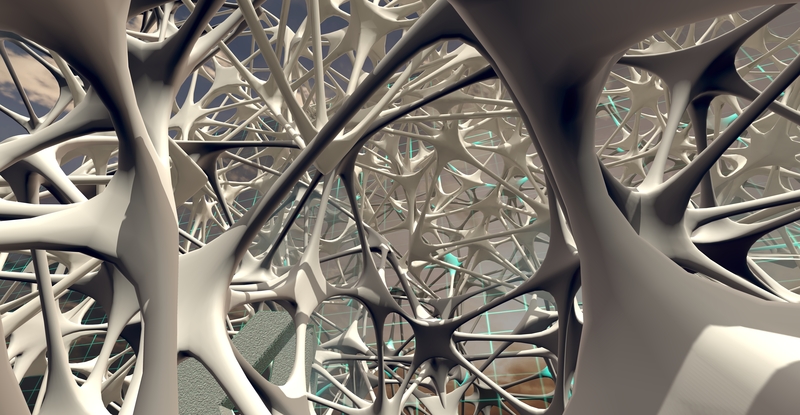 Bone Land is comprised of algorithmically generated 3D units. ​​NUMENA Virtual Reality Architects is a creative studio that develops virtual and augmented reality applications (VR/AR). Our interdisciplinary team combines programming and architecture to create immersive virtual experiences. Our integrated design process reveals the new possibilities that emerge at the dynamic boundary between the virtual and the real. At the core of NUMENA lies a fascination with the intersection between three-dimensional space and technology. Each project is a unique exploration of this connection and aims to create a space where products unfold their functionality, tell their story, and interact meaningfully with their users. The application will be made available for free on Steam in September 2018. For more information contact us at info@numena.de.